Most of the blogging advice you read online today is aimed at “solopreneurs” who are looking to build an audience to sell info-products or affiliate products to. That’s fine, but what about the startup bloggers? Specifically, I tend to get a ton of questions about the business-to-business community (about 1/3rd of the email that I get from my site is from new startup founders). Today I’d like to discuss 3 simple (but effective) B2B blogging strategies that you can implement immediately. Social media buttons are awful for page load speed (and even worse for mobile), yet many bloggers hang on to them like children, afraid to do away with even the most obscure buttons in hopes of getting that one additional share… bleh. While this advice is useful for ALL bloggers in every niche, it’s especially critical for B2B blogs. Many articles have since been published both for and against this change, but the general consensus seems to be this: you need to adjust the social buttons that you use for your audience. Know your customers and the networks that they use. Over at Help Scout, we’ve been tracking our social shares & conversions with HubSpot to see which ones are performing the best. We started out being concerned with our Facebook likes just like anybody else, but boy was that a waste! It turns out, LinkedIn is amazing for B2B sharing (jot that down B2B startups). The lesson here is that social sharing needs to be focused, don’t just add everything you can think of. Your blog isn’t the Huffington Post, you need to worry about quality traffic, not mass amounts of traffic. Find out what is working for your site and target those sites only, after all, psychological research has PROVEN that choice is demotivating: the more choices you have, the less likely people are to use them. Yup, SlideShare has been converting at nearly 50%, which is INSANE. That doesn’t even count the leads we receive from the opt-in forms that you can enable directly on your slides! Anyway, the key to being successful with SlideShare is that darn homepage, it gets hundreds of thousands of visitors, so getting featured in the top 3 for the day is going to result in a huge bump. The main strategies are to create data-intensive content that SlideShare’s professional audience loves, get your slideshows embedded on other sites, and pay attention to great design. It’s tough to go toe-to-toe with designs like that, but you DO have the option of picking up some of the incredible designs available on GraphicRiver. Here’s a link to the PowerPoint templates available. Many of them are really slick and will give you a fighting chance with the designs you’ll see on the SlideShare homepage. If you’re a B2B startup or a blogger that writes about business topics, you are missing out on a MASSIVE, professional, and highly engaged audience if you aren’t on SlideShare (just check those stats above, they speak for for me). This is taking over in the B2B realm, and I highly advise that you get in on the action too. Joint webinars are incredibly powerful: you have two or more folks with audiences all putting together great content in a single online webinar that anyone can attend, awesome! It’s great for your blog because you can use those emails that signed up and add them to your list (with permission of course, notify people beforehand). You can also do this automatically with WebinarBridge. Rand (SEOmoz) and Dharmesh (HubSpot) recently did this and were able to host one of the biggest webinars ever, entitled the “State of SEO & Internet Marketing, 2012”. Here’s the best part: You can host the webinars slides on SlideShare afterwards for even more exposure! That’s a lot of mileage out of one presentation. Plus, webinars are one of the most engaging forms of content available (readers get to hear your voice and maybe even see you, live). For all of you B2B bloggers out there, I’d love to hear your thoughts. As for “regular” bloggers (you’re all special to me :P), what did you think of these strategies? Thanks for reading, I’ll see you down in the comments. Gregory Ciotti is the founder of Sparring Mind and the marketing guy at Help Scout. I’ve been trying my hand in the affiliate world since October of last year. For a while I was on the front page of Google with some SEO methods, however that “honeymoon” period has since past. I’ve tried to promote my website, and I still am, via print and online media. I know it has been less than a year, I have only three social media plugs on my site, Facebook, Google+ and Twitter. I used to have something on every post. However, I was told that it was slowing down my page uploads. I’ve since removed everyone of them and just have three main buttons on the right side. My niche is a concierge service where I actually search for people to find them the best deal on items online. The problem is, getting traffic on a new website. I came across the affiliate world which was backwards from everything I learned of typical ‘sales’ from my youth. Instead of marking things up, merchants/stores actually reduce the price of items when an affiliate promotes their company for them. Either in directly making the price lower through a link or by providing coupon codes, sales, etc… to pass their savings onto the site users. With that said, I’m curious. Greg, is there a network of affiliates who aren’t afraid to say, hey, I’m an affiliate and this is what I do? One that want to or would want to set up or have set up an A2A program, kind of like the B2B would be? An Affiliate to Affiliate network where one isn’t afraid to say that they are what they are, as they are bringing items to the public for less than retail prices. I ask this, as I see all kinds of B2B marketing and networking sites. And all kinds of mom blogs, blogger to blogger sites, etc… whee networking is huge. However most of the deal sites out there don’t bluntly say, “we get paid for saving you money” or “we get paid each time you buy from our site.” Instead, so many of them hide under the cloak of their services. Before I learned about affiliate marketing, I used all kinds of deal sites without ever knowing that the owner was getting a kickback. I’m a recent graduate from college however, with this economy there aren’t any open teaching jobs in SoCal so I am now the stay-at-home dad with two kids and my wife is working. I do all I can to monetize my websites (all of which I started using or started brand new in the last 10 months). I figure if I can bring anything at all in, it is better than nothing. So… when the kids are awake, I’m Daddy. When my wife and children are asleep, I’m trying to bring in extra income via my websites. I’m sleeping about 3 hours a night, and doing all I can to legitimately develop, promote, advertise and build my website. I’m up to 100 likes on facebook… all real likes. None from just fluff. I’m a Husband, a Father, an Eagle Scout, a Veteran, and an honest person. Just looking to enjoy a piece of the affiliate world and make a living that will provide for my family, especially in this bad economy. Which is exactly what is driving my website. I save people money by posting deals, sales, coupons and other exclusive discounts to help people save money. The issue that I keep running into is that my website isn’t a typical “blog” that focuses on one niche area, as I wanted to have affiliate relationships with multiple companies, so that I can have the ability to help people save money on all kinds of items, products and services. So, from airlines and hotels to electronics and baby clothing and just about anything you can buy online, I’ve applied for and have been approved to be an affiliate of. From eBay to bebe to NewEgg and coupon printing companies, I’ve covered everything. Any idea where or how I can network with other Affiliates? I am also printed in CoffeeNews in a few large metro areas, in hopes that will bring traffic and business to my site. Interesting tactics and something I’ll definitely keep in mind for clients as my business grows. I wonder how well these techniques work in a multi-lingual environment when most of the content providers are monolingual (English)? One pet hate of mine is when people install a plugin that offers to display over 100 social media buttons and the blog owner tries to display ALL of them. You end up waiting about a minute for the page to fully load …. well I don’t because I have normally given up and moved on by then. Slide Share does convert almost 50% of customers to leads for my pdfs and documents uploaded to my slideshare account.I recommend to use if often for all marketing campaigns. @Slavko – Yup, that was my point exactly. In fact, I’d say SlideShare is primarily for B2B and nothing else (hence the post’s title). When social sharing buttons are concerned, it all depends on many variables. The niche gets to play a big part in this too. For example, if you are in the health and fitness niche, chances are you can do very well on StumbleUpon. In relation to that it’s a good thing to try the StumbleUpon sharing button below your post. List posts usually do well here, so you can get up to couple of hundreds visitors in just few hours. As far as Slide Share goes, it usually works better with more business oriented ideas and presentations. Though you can never know for sure. Great three B2B strategies that are very critical in today’s market. Smart tactics from an SEO perspective that will definitely play a positive role and help captivate audiences around the web! I’ve just been recently using social sharing buttons which were advised by other bloggers too. I have yet to see the advantages or disadvantages for my blog. Those are really great strategies which I’m yet to try. I can’t believe that by removing Facebook like button the traffic from Facebook increased at SmashingMagazine. Still I’m willing to try SlideShare ones. 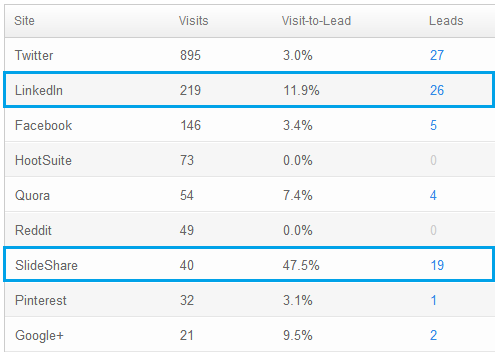 It’s interesting to see your lead conversions…. thanks for sharing the stats. I removed social share icons several months ago, if the page hung, it was due to the js for the social sites or the plugin that managed them. With product sites, it created more sales…and socially, we run social marketing campaigns, which builds a much larger following than likes ever did, allowing us to interact with more people directly. I’m testing g+ now, which is rather fast… but I’m finding people will click a link to the page and circle us then share, rather than share what they find on the page/profile directly. I just recently started using slideshare, I’ve received about 70 views in the last 5 days on my first presentation, did you find upgrading your account to pro helped with more exposure?